Management algorithms based on neck zonal anatomy (Table 1) and wound depth were developed in the 1970’s.7-9,13-18Using this approach, patients with wounds to zone II of the neck underwent mandatory exploration, regardless of patient vital signs and additional physical findings. Due to the difficult surgical exposure, zone I and zone III injuries were managed with a battery of invasive and semi-invasive tests, including catheter angiography, endoscopy, laryngoscopy and esophagography, all of which have focused utility and are tailored to evaluating specific anatomy.11,19-22 These tests require additional time and expertise, which may not always be available at all centers. A more comprehensive test to limit evaluation time and optimize resources was therefore desirable. 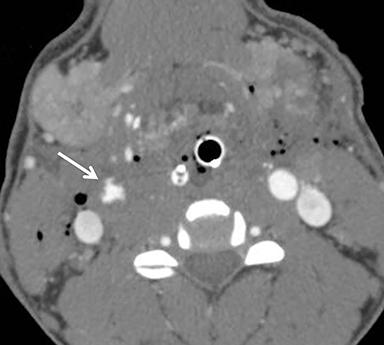 This review focuses on image-based evaluation and management as dictated by neck CTA. Strategies, pearls and pitfalls will be emphasized using an anatomical approach. CT angiography has been shown to be highly accurate in diagnosing a myriad of penetrating neck injuries; thus, it has become the evaluation workhorse for patients with such injuries.1,4,6,7-9,10,13,16-18,24,26-28 Much of the research on CTA in this setting has been focused on vascular injuries, as stroke is the dreaded consequence of cervical vascular injuries. CT angiography, even using older technology, performs well for the diagnosis of cervical vascular injuries, with sensitivities and specificities routinely exceeding 90%.5,7,10,16,17,25 Further technological advances have shown incremental improvements in performance (Table 3). Arterial injuries are seen in approximately 10-25% of patients with penetrating neck injuries, with the carotid arteries involved approximately twice as often as the vertebral arteries.10,18,20,23 Stroke can be seen in up to 15% of patients, with carotid artery injuries resulting in death in 22%.8,18,34,35 These are, therefore, common and clinically significant injuries that require rapid diagnosis and triage to definitive therapy by experienced practitioners. 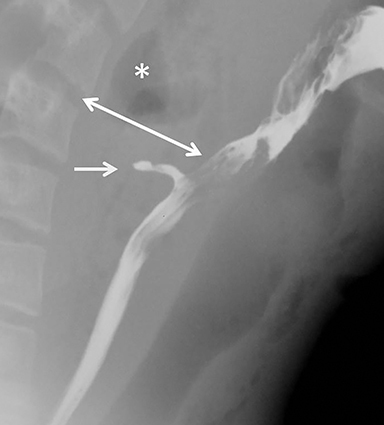 Much like arterial injuries elsewhere in the body, penetrating cervical vascular injuries may manifest as occlusion (partial or complete, Figures 2-4, 8), pseudoaneurysm (Figure 2), focal intimal injury (Figures 5,6), dissection, active bleeding (Figures 7, 8), and arteriovenous fistula (Figure 9). No further imaging evaluation is required when these pathologies are identified on CTA, and the patient can be triaged to definitive therapy. 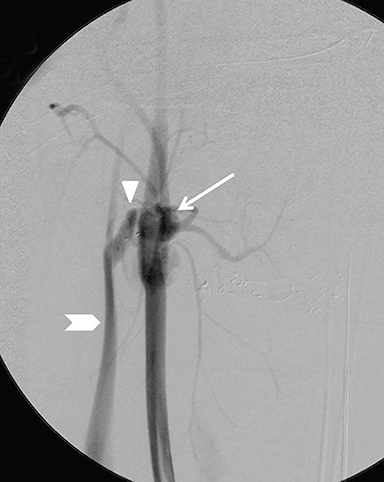 Although most CT protocols for evaluating PNI focus on optimizing peak arterial enhancement, venous opacification can be present and may be used to diagnose venous injuries (Figure 10). Venous injuries following penetrating neck trauma are seen in 16-18% of patients19,25,36 and have historically been the most frequently missed such injuries on physical exam.36 Coupled with the overall decreasing prevalence of surgically diagnosed venous injuries due to increasing imaging utilization, this suggests that these injuries are of doubtful clinical significance. Nonetheless, venous injuries identified on CTA should be described and reported. Esophageal and tracheolaryngeal injuries following PNI are relatively uncommon, with esophageal trauma seen in 0.9-6.6% of patients10,13,37-40 and tracheolaryngeal injuries seen in 1-7%.10,38,41,42 This is fortunate, as direct CT findings may be absent, with the only imaging finding manifested as cervical emphysema, which could be introduced through the penetrating wound tract. 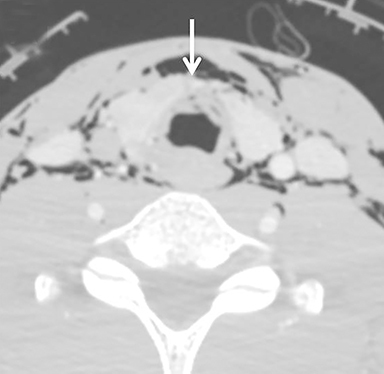 Cervical spinal cord injuries are rarely seen directly on neck CT angiography. Instead, the radiologist should rely on the wound trajectory to infer the presence of such an injury.5,51 (Figures 2, 4, 8). 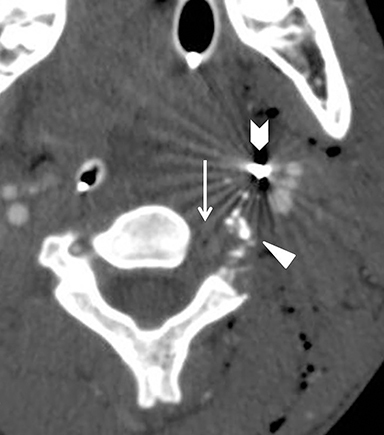 Patients with metallic foreign bodies are not candidates for MRI; efforts should be made to infer the presence of a cord injury on CT and recommend correlation with physical exam findings and neurological deficit. 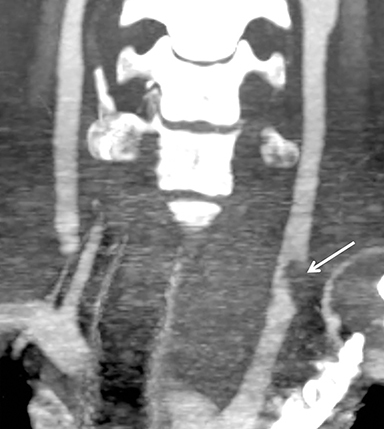 CT angiography is the current accepted standard for the evaluation of patients with PNI who do not have indications for immediate surgical exploration. The modality is quick, accurate, and reliable, and it can be used to significantly reduce the number of nontherapeutic neck explorations. Further management decisions can be based on CTA findings and used to rapidly triage patients to either surgical intervention or observation. Biffl WL, Moore EE, Rehse DH, et al. Selective management of penetrating neck trauma based on cervical level of injury. Am J Surg. 1997;174(6):678-682. MacFarlane C, Benn CA. Penetrating neck injury: A review. Trauma. 2002;4(2):79-90. Miller RH, Duplechain JK. Penetrating wounds of the neck. Otolaryngol Clin North Am. 1991;24(1):15-29. Múnera F, Soto JA, Palacio D, et al. Diagnosis of arterial injuries caused by penetrating trauma to the neck: comparison of helical CT angiography and conventional angiography. Radiology. 2000;216(2):356-362. Steenburg SD, Sliker CW, Shanmuganathan K, et al. 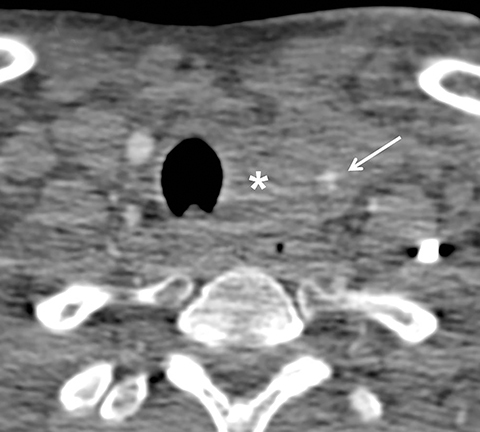 Imaging of penetrating neck injuries. RadioGraphics. 2010;30:869-886. Gracias VH, Reilly PM, Philpott J, et al. Computed tomography in the evaluation of penetrating neck trauma: A preliminary study. Arch Surg. 2001;136 (11):1231-1235. Ramadan F, Rutledge R, Oller D, et al. 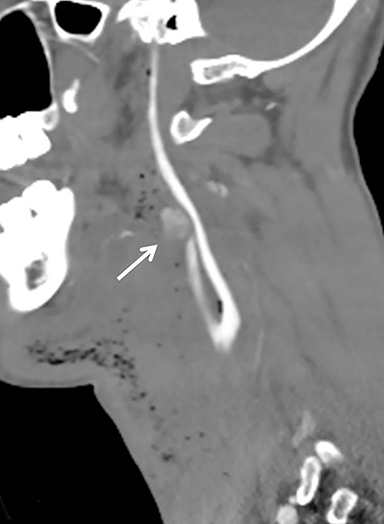 Carotid artery trauma: A review of contemporary trauma center experiences. J Vasc Surg. 1995;21(1):46-55; discussion 55-56. Sperry JL, Moore EE, Coimbra R, et al. Western Trauma Association critical decisions in trauma: Penetrating neck trauma. J Trauma Acute Care Surg. 2013;75(6):936-940. Inaba K, Branco BC, Menaker J, et al. Evaluation of multidetector computed tomography for penetrating neck injury: A prospective multicenter study. J Trauma. 2012;72(3):576-584. Bishara RA, Pasch AR, Douglas DD, et al. The necessity of mandatory exploration of penetrating zone II neck injuries. Surgery. 1986;100(4):655-660. Elerding SC, Manart FD, Moore EE. A reappraisal of penetrating neck injury management. J Trauma. 1980;20(8):695-697. Bell RB, Osborn T, Dierks EJ, et al. 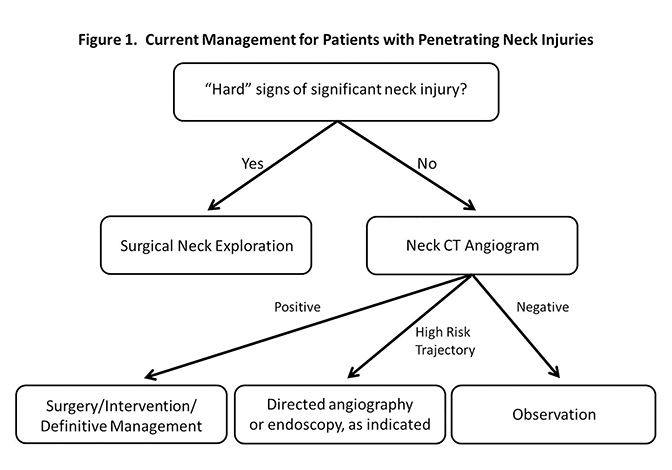 Management of penetrating neck injuries: A new paradigm for civilian trauma. J Oral Maxillofac Surg. 2007;65(4): 691-705. Azuaje RE, Jacobson LE, Glover J, et al. Reliability of physical examination as a predictor of vascular injury after penetrating neck trauma. Am Surg. 2003; 69(9):804-807. Demetriades D, Theodorou D, Cornwell E, et al. Evaluation of penetrating injuries of the neck: Prospective study of 223 patients. World J Surg. 1997;21 (1):41-47; discussion 47-48. Mazolewski PJ, Curry JD, Browder T, et al. Computed tomographic scan can be used for surgical decision making in zone II penetrating neck injuries. J Trauma. 2001;51(2):315-319. Múnera F, Soto JA, Palacio DM, et al. 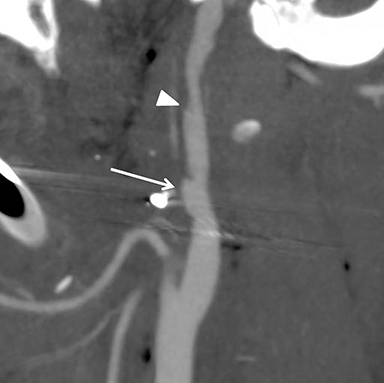 Penetrating neck injuries: Helical CT angiography for initial evaluation. Radiology. 2002;224(2):366-372. Nuñez DB Jr, Torres-León M, Múnera F. Vascular injuries of the neck and thoracic inlet: Helical CT-angiographic correlation. RadioGraphics. 2004;24 (4):1087-1098; discussion 1099-1100. Apffelstaedt JP, Müller R. Results of mandatory exploration for penetrating neck trauma. World J Surg. 1994;18(6):917-919; discussion 920. Asensio JA, Valenziano CP, Falcone RE, et al. Management of penetrating neck injuries: The controversy surrounding zone II injuries. Surg Clin North Am. 1991;71(2):267-296. Fry WR, Dort JA, Smith RS, et al. Duplex scanning replaces arteriography and operative exploration in the diagnosis of potential cervical vascular injury. Am J Surg. 1994; 168(6):693-695; discussion 695-696. Meyer JP, Barrett JA, Schuler JJ, et al. Mandatory vs selective exploration for penetrating neck trauma: a prospective assessment. Arch Surg. 1987;122(5):592-597. Múnera F, Cohn S, Rivas LA. 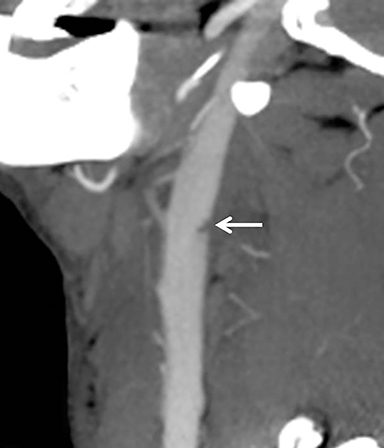 Penetrating injuries of the neck: Use of helical computed tomographic angiography. J Trauma. 2005;58(2):413-418. 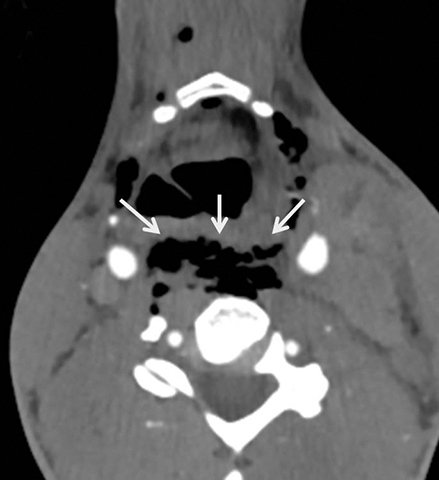 Múnera F, Soto JA, Nuñez D. Penetrating injuries of the neck and the increasing role of CTA. Emerg Radiol. 2004;10(6):303-309. Inaba K, Muñera F, McKenney M, et al. Prospective evaluation of screening multislice helical computed tomographic angiography in the initial evaluation of penetrating neck injuries. J Trauma. 2006;61 (1):144-149. Osborn TM, Bell RB, Qaisi W, et al. 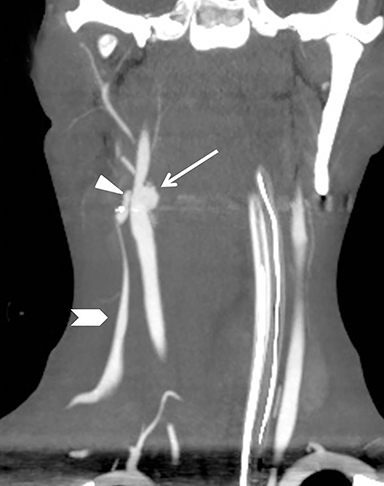 Computed tomographic angiography as an aid to clinical decision making in the selective management of penetrating injuries to the neck: A reduction in the need for operative exploration. J Trauma. 2008;64(6): 1466-1471. Woo K, Magner DP, Wilson MT, et al. 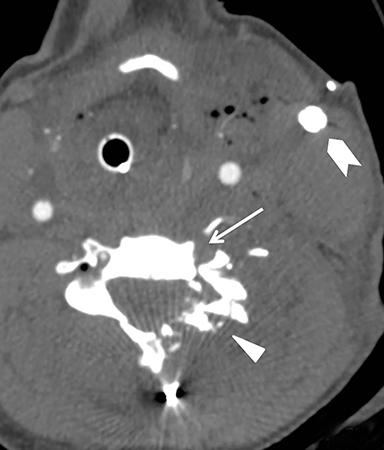 CT angiography in penetrating neck trauma reduces the need for operative neck exploration. Am Surg. 2005;71(9):754-758. LeBlang SD, Nuñez DB, Rivas LA, et al. 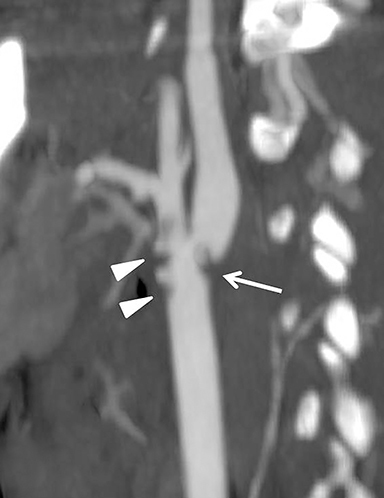 Helical computed tomographic angiography in penetrating neck trauma. Emerg Radiol. 1997;4(4):200-206. Shiroff AM, Gale SC, Martin ND, et al. Penetrating neck trauma: A review of management strategies and discussion of the “no zone” approach. Am Surg. 2013;79(1):23-29. Demetriades D, Skalkides J, Sofianos C, et al. Carotid artery injuries: Experience with 124 cases. J Trauma. 1989;29(1):91-94. Kendall JL, Anglin D, Demetriades D. Penetrating neck trauma. Emerg Med Clin North. Am 1998;16 (1):85-105. McIntyre WB, Ballard JL. Cervicothoracic vascular injuries. Semin Vasc Surg. 1998;11(4):232-242. Mirvis SE, Shanmuganathan K. Imaging in trauma and critical care. Philadelphia, Pa: Saunders; 2003. Kuehne JP, Weaver FA, Papanicolaou G, et al. 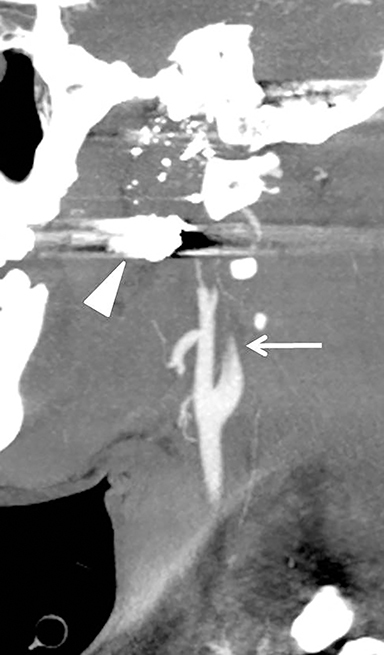 Penetrating trauma of the internal carotid artery. Arch Surg. 1996;131(9):942-947; discussion 947-948. Parikh AA, Luchette FA, Valente JF, et al. 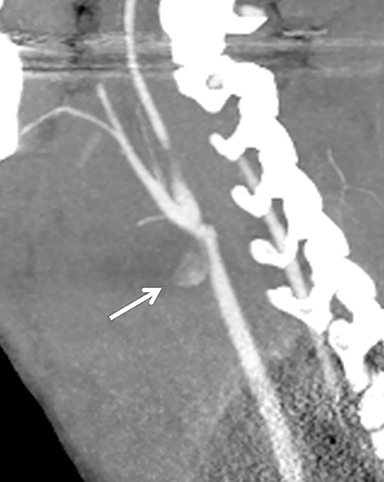 Blunt carotid artery injuries. J Am Coll Surg. 1997;185(1):80-86. Gonzalez RP, Falimirski M, Holevar MR, et al. Penetrating zone II neck injury: Does dynamic computed tomographic scan contribute to the diagnostic sensitivity of physical examination for surgically significant injury? A prospective blinded study. J Trauma. 2003;54(1):61-64; discussion 64-65. Nel L, Jones LW, Hardcastle TC. Imaging the oesophagus after penetrating cervical trauma using water-soluble contrast alone: Simple, cost-effective and accurate. Emerg Med J. 2009;26(2):106-108. Demetriades D, Velmahos GG, Asensio JA. 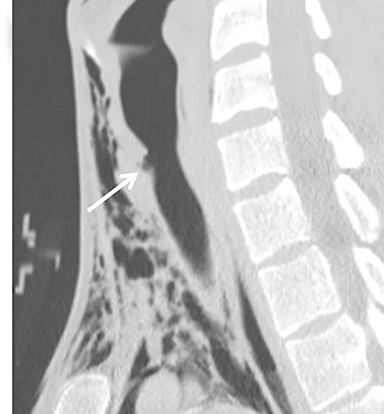 Cervical pharyngoesophageal and laryngotracheal injuries. World J Surg. 2001;25(8):1044-1048. McConnell DB, Trunkey DD. Management of penetrating trauma to the neck. Adv Surg. 1994;27:97-127. Symbas PN, Hatcher CR Jr, Vlasis SE. 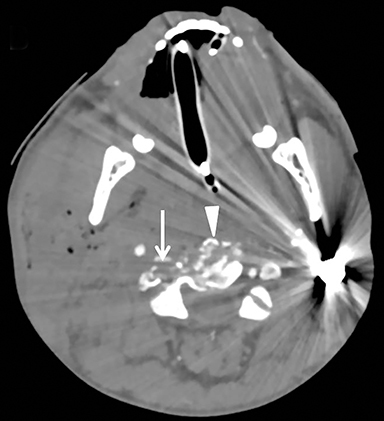 Esophageal gunshot injuries. Ann Surg. 1980;191(6):703-707. 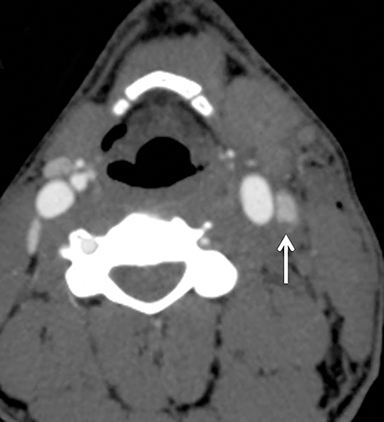 Kuttenberger JJ, Hardt N, Schlegel C. Diagnosis and initial management of laryngotracheal injuries associated with facial fractures. J Craniomaxillofac Surg. 2004;32(2):80-84. Verschueren DS, Bell RB, Bagheri SC, et al. Management of laryngo-tracheal injuries associated with craniomaxillofacial trauma. J Oral Maxillofac Surg. 2006;64(2):203-214. Cheadle W, Richardson JD. Options in management of trauma to the esophagus. Surg Gynecol Obstet. 1982;155(3):380-384. Srinivasan R, Haywood T, Horwitz B, et al. Role of flexible endoscopy in the evaluation of possible esophageal trauma after penetrating injuries. Am J Gastroenterol. 2000;95(7): 1725-1729. Hanpeter DE, Demetriades D, Asensio JA, et al. Helical computed tomographic scan in the evaluation of mediastinal gunshot wounds. J Trauma. 2000;49(4):689-694; discussion 694-695. Mandavia DP, Qualls S, Rokos I. Emergency airway management in penetrating neck injury. Ann Emerg Med. 2000;35(3):221-225. Stanley RB Jr. Value of computed tomography in management of acute laryngeal injury. J Trauma. 1984;24(4):359-362. DeVivo MJ, Rutt RD, Black KJ, et al. Trends in spinal cord injury demographics and treatment outcomes between 1973 and 1986. Arch Phys Med Rehabil. 1992;73(5):424-430. Nobunaga AI, Go BK, Karunas RB. Recent demographic and injury trends in people served by the Model Spinal Cord Injury Care Systems. Arch Phys Med Rehabil. 1999;80(11):1372-1382. Sekhon LH, Fehlings MG. Epidemiology, demo-graphics, and pathophysiology of acute spinal cord injury. Spine. 2001;26(24 suppl):S2-S12. Thompson EC, Porter JM, Fernandez LG. Penetrating neck trauma: An overview of management. J Oral Maxillofac Surg. 2002;60(8):918-923. LeBlang SD, Nuñez DB Jr. Helical CT of cervical spine and soft tissue injuries of the neck. Radiol Clin North Am. 1999;37(3):515-532. Steenburg SD, Leatherwood D. Penetrating neck trauma: A review of image-based evaluation and management. Appl Radiol. 2016;45(1):17-26. Dr. Steenburg and Dr. Leatherwood are radiologists in the Department of Radiology and Imaging Sciences, Division of Emergency Radiology, Indiana University School of Medicine, Indianapolis, IN.